On October 23rd, I sat beside my wife, Gail, in the White House’s East Room, awaiting the arrival of an old Special Forces comrade, Gary (Mike) Rose. And the President of the United States. While we waited, my mind drifted back many years. Almost a half-century ago, I was aboard a tiny spotter plane above the wilderness of southern Laos. Below lay the Ho Chi Minh Trail – not a “trail” but a 2500-mile road network, the logistical lifeline to North Vietnamese troops fighting in South Vietnam. Hidden beneath the jungle canopy were base camps, ammunition dumps and thousands of trucks. That day, September 13, 1970, I was flying a visual recon, getting the lay of the land along Laotian Highway 165, where soon I would lead my 8-man Special Forces recon team on an intelligence gathering mission. Our flight was interrupted by radio chatter – deeper in Laos, we learned, a U.S. Green Beret-led unit was in serious trouble. We flew over to take a look. Our unit, the innocuously named Studies and Observations Group (SOG), conducted top secret cross-border operations, taking the war deep behind enemy lines in Laos, Cambodia and (rarely) North Vietnam. These were covert, deniable missions; even SOG’s existence was classified. Officially, the United States had no forces fighting in “neutral” Cambodia or Laos. In a few minutes we were over the heavily engaged SOG force. Looking down at an opening in the trees, I saw a huge HH-53 helicopter, shot-down by anti-aircraft guns. My pilot and I feared the SOG force might not get out of there. They almost didn’t. Three days earlier, led by then-Captain Eugene McCarley, the SOG company of 19 American Green Berets and 100 Montagnard hill tribesmen had landed; their job was to kick up such a ruckus that the enemy would divert forces from an offensive elsewhere in Laos to come after them. SOG operations were extremely hazardous. We used to joke and say running one SOG mission was no big deal – anybody could do it. But to volunteer for a SECOND mission – that required enormous courage. This was late in the war and most American combat units had already withdrawn or were withdrawing; support for the war was waning. These men knew that their mission was especially hazardous. Yet not one Green Beret hesitated to go. That’s a level of dedication few people would understand. A Special Forces medic volunteered to go along, too. It was Mike Rose. Over the next three days, the SOG company blew up a huge ammunition dump, raided a major enemy headquarters, destroyed trucks and all along the way fought off enemy forces. Twice Mike ran through enemy fire to rescue wounded men; he shielded a wounded comrade with his own body and suffered serious wounds. He hardly slept those 72 hours, treating 60 wounded men, including all 19 Americans. Three Montagnards died. Mike himself was hit three times and had to cut a makeshift crutch from a tree branch. And then during the extraction his chopper was shot down and he treated still more injured men. Mike was submitted for the Medal of Honor, but classified details could not be disclosed. It was downgraded to the Distinguished Service Cross and the entire affair became forgotten. 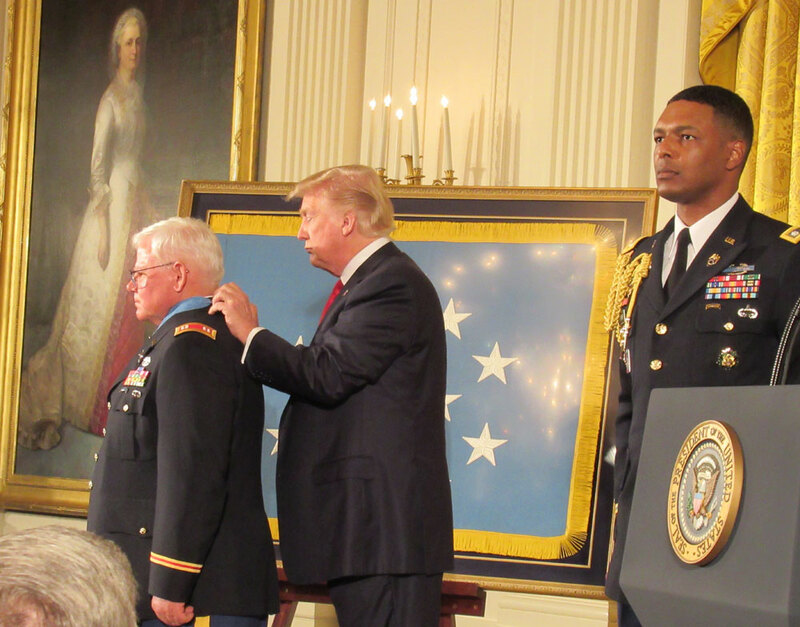 After presenting the Medal, President Trump had a short private meeting with Rose and his fellow Special Forces comrades. Each of us shook the president’s and vice-president’s hands; I spoke briefly with President Trump. In all those years, not once did I ever hear Mike speak of himself or the risks he’d undertaken. Quiet, church-going, humble, nowadays he volunteers at a soup kitchen in Alabama. Mike will tell you, he was just doing his job. But we all knew better. I wish Mike had received his Medal of Honor back in 1970. Yet, now is a better time because the American people recognize the risks and sacrifices our service members make, and unlike 1970-71, they truly appreciate our Vietnam veterans. And a half-century wrong has been righted.